This print depicts a dramatic kabuki scene of the young man Tokijiro on his way to rescue his lover, the Yoshiwara courtesan Urazato. The beauty’s employer and his wife tied her up in the snowy courtyard and beat her after discovering her affair with the young man. The poor beauty kneels in the snow at right, bound with rope around her torso, as the elderly employers beat her with a broom and a stick. At left, Tokijiro stealthily climbs over the courtyard fence at left, his sword dangling from a cord between his teeth. The lovers’ young daughter, Midori, hides her face in the snow below. The story concerns the prostitute Urazato who has had a child by the samurai Tokijiro. 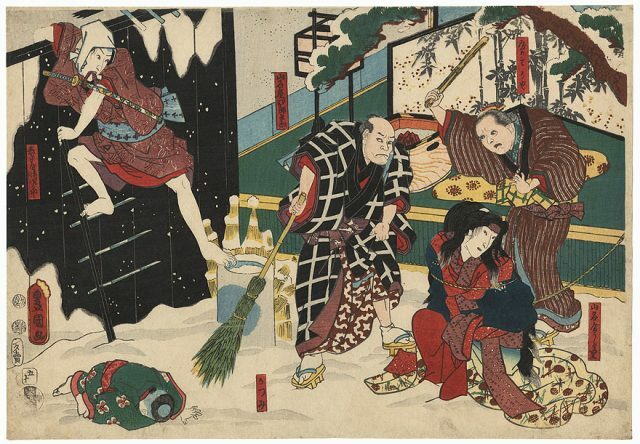 Tokijiro has fallen on hard times and cannot buy her out of her brothel – we see him here in the exquisite left hand panel, climbing a cherry tree, snow cascading, his sword at his side. His lover occupies the centre panel; she has been tied to a tree as punishment for attempting to flee and the brothel owner in the right panel is beating her with a broom; her kamuro (young assistant) is trying to stop him. Tokijiro later cuts her free and they escape only to commit suicide together in despair at their circumstances.